Our microgreens are delicious and nutritious! There are many benefits and unique qualities that microgreens have. Here are just a few of them. Growing microgreens is a relatively quick process compared to other vegetables because they are essentially the stage between sprouts and a full-grown vegetable. They take about 7-10 days before they are ready to be harvested (the full-grown forms can take weeks to grow). Additionally, they do not need much sunlight or space, which makes them great plants to grow. We are constantly growing and harvesting microgreens, so contact us if you want to get some. Perhaps the greatest health benefit associated with eating microgreens is their level of antioxidants. In addition to this, they also provide the benefits (vitamins, reduced risk of medical conditions, etc) of eating vegetables in general. They are said to reduce the risk of conditions such as heart disease, diabetes, and certain cancers. Microgreens’ nutrients are concentrated, which provides even more of a benefit than the mature versions of the plants. 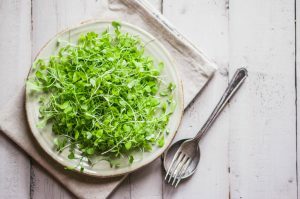 You can add microgreens to your diet in many different ways, including using them as a garnish, mixing them into smoothies, and using them as pizza toppings. No matter what you’re eating, it’s easy to include microgreens in your recipes. This entry was posted on Wednesday, October 10th, 2018 at 9:30 am. Both comments and pings are currently closed.